WACO, Texas (March 20, 2019) – The Keston Center for Religion, Politics and Society at Baylor University, in partnership with the McBride Center for International Business in the Hankamer School of Business, will present a Diplomatic Forum at 11 a.m. Thursday, March 21, in rooms 143-144 of the Paul L. Foster Campus for Business and Innovation. The Diplomatic Forum is held in conjunction with the 13th annual Global Business Forum, during which international scholars, business professionals and public officials will explore the continuing transformation of Chinese society and its role in the global system. Joanne Held Cummings: A career Foreign Service Officer of the U.S. Department of State, is currently serving as Policy Advisor to the Combined Joint Task Force Operation Inherent Resolve in Baghdad. Cummings has served as foreign policy advisor, refugee coordinator, consular officer, political officer, and economic and political section chief in various posts, and has taught at the U.S. Air Force Academy in Colorado Springs. She has worked in many regions of the world, such as the Middle East, North Africa and East Africa. Col. Paul Roush: A retired Colonel of the U.S. Marine Corps and a retired professor of the U.S. Naval Academy, Col Roush served with the First, Second and Third Marine Divisions in the United States, Japan and Vietnam. During 1977-1980, he served as an Assistant Naval Attaché at the U.S. Embassy in Moscow. During Col. Roush’s time in Moscow, victims of religious persecution called the Siberian Seven arrived in the U.S. Embassy and awaited safe passage to the United States, becoming one of the most significant moments for U.S. diplomacy in the 20th century. Roland H. Smith: Smith was a member of the British Diplomatic Service from 1967-2002, including posts as Deputy Ambassador to NATO (1992-1995), Director for International Security in the Foreign Office (1995-1998) and Ambassador to Ukraine (1999-2002). Since his retirement from the Diplomatic Service in 2002, Smith has been a member of the Council of Management of the Keston Institute in Oxford, England. 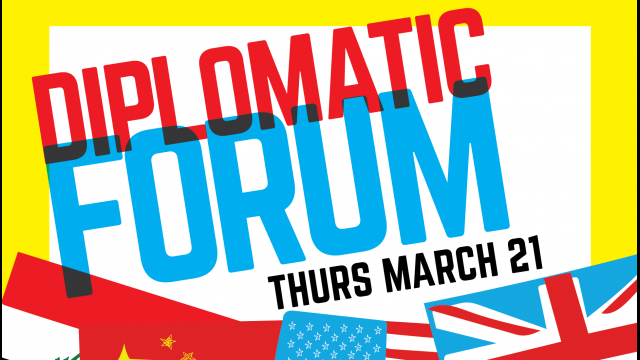 During the forum, speakers will reflect on their work in embassies and the role of diplomacy. Following their presentations, the panel will engage in a moderated discussion with the audience on diplomacy in the current international climate, including China and across the world. “These three speakers bring a wealth of knowledge and unique perspectives on international relations garnered from first-hand experiences in a variety of situations and settings as ambassadors, foreign service officers and embassy attachés,” said Kathy Hillman, director of the Keston Center. Baylor University established the Keston Center for Religion, Politics and Society to receive, maintain, preserve, expand and make available to scholars the Keston Archives and Library, the world’s most comprehensive artificially assembled collection of materials on religious persecution under communist and other totalitarian regimes. Originally located at Keston College in Oxford, the Keston collection arrived in Waco in 2007. The Keston Center became part of the Baylor Libraries in 2012. A free luncheon will follow the Diplomatic Forum as part of the Global Business Forum program. Registration for the luncheon is required and can be accessed HERE. For more information about the Diplomatic Forum, visit www.baylor.edu/kestoncenter.